I'm selling lasercut tricopter middle sections. It is the Optimized RCExplorer Tricopter Template (thanks Colorex and RCExplorer for this). 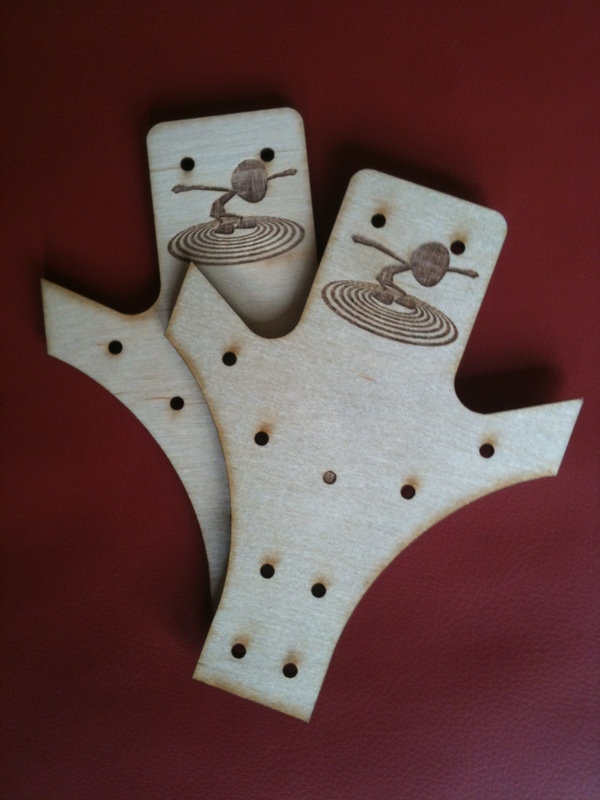 They are lasercut from 4mm birch plywood and weigh 29 grams for a set(top + bottom). The flitetest logo is laser engraved, the dot is the COG. They are &#8364;12 per set (~$15.75*). Shipping to europe is &#8364;2,55 , shipping to the rest of the world is &#8364;2,85 (~$3.75*). If you want one (or more) or have any questions send me a PM. Also if you want them a bit different(for different size arms or with a different logo) send me a PM and we can make a deal. *price in dollars will change a little because of the fluctuation in the rates, a good online converter is found at www.xe.com. The advantage in laser-cut pieces is the accuracy - no more misaligned holes, and perfect copies of each plate. Just a suggestion, make the logo slightly smaller. For what diameter wooden spars is this ? they are the Optimized RCExplorer Tricopter Template, so they are made for 10mm arms. If you want them for other size arms I can make them too, will take a bit longer (and cost a bit more) because they need to be designed and cut first. remember - 10mm is for width only - you can use 10*15mm if you need stronger arms. What size arms are you going to use? Me? 9x9 mm. Could not find the 10x10 mm here. For the length, don't know exactly yet, about the same as David I think. 9x9 will allow the front arms to bend too much to the back. They might also break more easily. I think you mean to the front, but yes you are right, the arms will not be at exactly 120°. They'll probably brake more easily, but I expect they'll do fine. still waiting for the setup, so I can't test yet. I would need the frame-holes to match 12x12mm size as these are everywhere available in the Netherlands .. 9x9mm is too weak this tricopter. I compared regular 10*10mm wood and they was heavier than the regual 10*10mm I use. If you want me to I can buy alu in 1 or 2meter lengths, cut them up and send them to you. PM me if you want me to go ahead with this. I'll go ahead and fix the plans for 9 mm and 12 mm - It's just a matter of rearranging the holes for the screws, not a big deal. What format do you use for your cutter, Koekie? Sure! I'll mail them to you! Thanks guys, great work ! The Optimized Tricopter Template has a homepage now thanks to UndCon! From there you can download The latest version, revision 1.2, in PDF, DWG, or DXF formats. I have made the necessary modifications to use 9 or 12 mm booms. They are available in PDF, and also inside the DXF and DWG files if you want the vector files. At school we use CorelDraw 12. Just imported the dxf file and put the flitetest logo in them. Thank you very much Colorex for making these files, and UndCon for hosting them. @UndCon, thanks for the offer for cutting me alu, but I'll build a wood one first, when it flies(and I can flie with it ) I'll try to build a carbon one. I think the original template (the one David made) was designed in Corel - and that's why it's slightly off with dimensions. CAD is exact to the decimal you want. KoekieMonster - send me a pm with info if you want me to add that.